Technology Transfer is about moving inventions from the laboratory to the marketplace. Every major university and government laboratory conducts technology transfer activities by harvesting inventions from researchers, managing their invention portfolio, and transferring selected inventions into the marketplace via licensing agreements with industry. Technology transfer creates substantial strategic, economic, and societal value for licensees and the US every year. 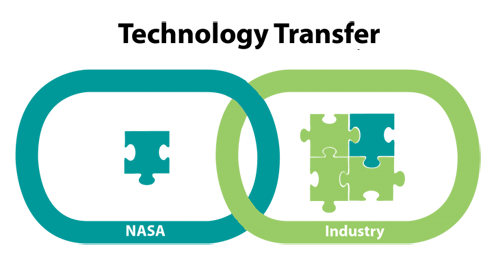 Technology transfer is one of the three core program areas of responsibility within NASA GSFC’s SPO. An invention disclosure form is a document organizations commonly use for staff to communicate inventive ideas to management. NASA’s invention disclosure form is called a New Technology Report (NTR) which is also known as NASA Form 1679. All completed NTRs must be submitted to the Strategic Partnerships Office (SPO) for processing which also shares the form with GSFC’s Office of Patent Counsel (OPC). All GSFC civil servants and contractors should disclose new ideas to the SPO. A single invention that is developed by multiple inventors only requires a single NTR (which can be submitted by one inventor so long as all inventors are properly cited). What types of ideas should be disclosed? All new ideas related to technology development should be disclosed. Ideas are often embodied in devices (e.g., machines, products, apparatuses), processes (e.g., methods, techniques, recipes), systems, materials, tools, fixtures, and software. When should an invention be disclosed? Ideas should ideally be disclosed at conception (i.e., reduction to practice is not required). Subsequent NTRs can be submitted as an idea is further developed, prototyped, and tested. Inventors should focus on disclosing inventions, and not be concerned whether or not their inventions are marketable, technically ready, or patentable (the SPO will focus on these topics). Where should the NTR form be sent? Completed NASA 1679 forms should be delivered through the e-NTR system. Why should an inventor submit an NTR (what are the benefits to the inventor)? Inventors should submit an NTR because they (1) are required via NASA policy, (2) share in any licensing income, (3) may earn various awards, (4) help NASA, (5) builds their resume, and (6) helps our country and society at large. How can an inventor receive help regarding NTR form completion? Inventors can contact the SPO to receive assistance with NTR completion via techtransfer@gsfc.nasa.gov or 301-286-5810. Our staff can answer questions about the form and even help populate selected fields based upon existing documents (though the lead inventor must ultimately approve and sign the NTR form to enable official submission). What happens after submitting an NTR? The SPO harvests over 250 NTRs from GSFC inventors each year. Upon receipt, the NTR is filed in a database and the inventor is contacted as additional information is needed. SPO engineering and marketing staff evaluate each NTR using success factors including ownership situation, IP protection potential, market attractiveness, technology readiness, and inventor enthusiasm for commercialization. Selected NTRs are then routed for the pursuit of patent protection and active marketing to potential licensees/partners. Other NTRs are allowed to further incubate and reassessed at a later date. The SPO proactively seeks out potential licensees to facilitate technology transfer within budget constraints. GSFC inventors are included in these commercialization pursuits to the extent they have the time and interest where some minimum amount of inventor involvement is required. An inventor who has submitted an NTR is always welcome to contact the SPO for an update since commercialization of an invention is often a multi-year process.